19 February 2014, ST GEORGE’S: Last night marked the end of the collaborative aspect of the visual arts/cultural residency in Grenada of Haitian artist Jean Renel Pierre-Louis. The AMITYE (Friendship in kreyole) Exhibition opened to a large appreciative audience. Present at the opening were Minister for Tourism and Culture Alexandra Otway-Noel and Parliamentary Secretary for Culture, Senator Brenada Hood from the Ministry, as well as Mrs Lisa Francis Art Director at the Ministry of Education. Also present were the US Charge D’Affaires, members of business community as well as the Saint George’s University (SGU) and University of the West Indies (UWI) communities, art students, artists, art lovers, collectors, supporters and sponsors of the residency and the exhibition. 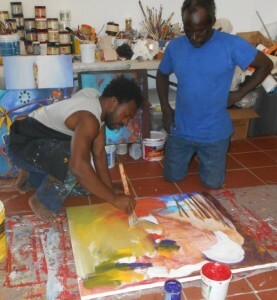 Painter, photographer and filmaker Jean Renel Pierre-Louis (artist name PrensNelo) is a protégé of Mario Calixte, a former professor of ENARTS (Ecole Nacional Des Artes Haiti). He has participated in several group events in the Dominican Republic (2003), the United States (2005), Switzerland and Brazil (2009) as well as shows in Haiti, including PromartHaiti’s Atelier d’Art International (2012 and 2013). 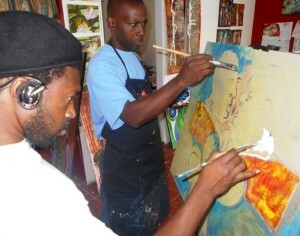 He is versed in the various styles of Haitian art but prefers the surrealist and abstract styles. PrensNelo arrived in Grenada midday on 26 January. The art residency was facilitated at my studio (ärs lôngà), located at Sans Souci in the capital parish of Saint George – within yards of Mount Royal the official residence of the Prime Minister. Within hours of his arrival at my studio, PrensNelo laid out background textures to ten canvasses — measuring from 600 to 4260 square inches — a novel way of fighting off jet-lag… even if the jet was LIAT. 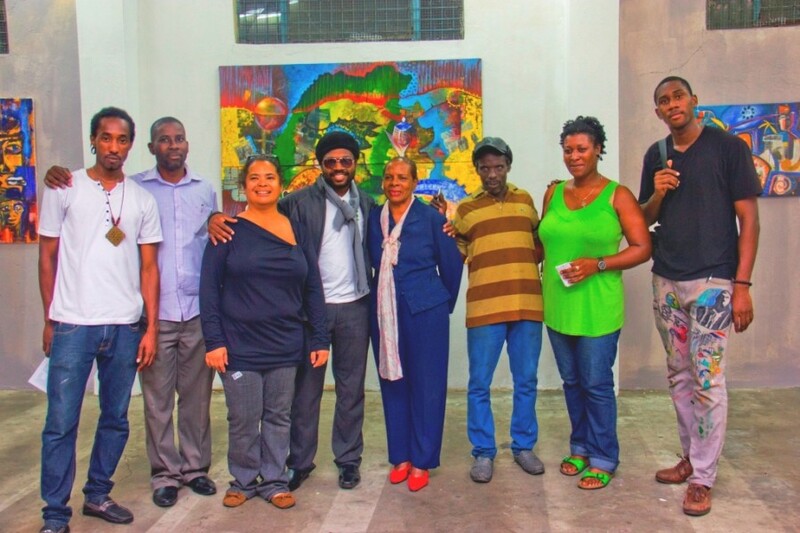 PrensNelo and I met at an international art camp in Petion Ville, Haiti in November 2013 organised by Patrick Cauvin of Promart Haiti. For ten days PrensNelo collaborated with Grenadian artists Andrea McLeod, Teddy Dwight Frederick, Nico Thomas, Doliver Morain, Roland Benjamin and myself. He observed our painting styles and introduced us to some techniques which are used to produce Haitian art. Andrea McLeod is a lecturer in art at TAMCC and SGU. Her works use Adinkra symbols to represent our traditions, sea voyages, and hopes for the future across the diaspora with advice from our collective past. Teddy Frederick is a contemporary mixed media artist, photographer and film maker. He holds a certificate in visual arts from Cambridge University, London. Nico Thomas is a mixed media painter with a Bachelor’s degree in Visual arts from the Institute Seni Indonesia Padangpanjang. Doliver Morain’s naive expressionist style is a direct reflection of his hunting and marine environment in the parish of Saint Patrick. Benjamin refers to his work as Cubism Abstract Expressionism Illustrative, through which he examines the stresses of life and memories linked to decade of travesties and misfortune of our Caribbean people. Suelin Low Chew Tung is a mixed media expressionist painter. The AMITYE exhibition is being held in a disused garage situated off Tryne Alley on the Carenage, a cavernous space generously donated for the event by merchant firm Hubbards. Forty works are exhibited – many of them direct collaborations with PrensNelo and/or the other artists in the group. During the exhibition, which runs until 4 March, workshops and artist talks are scheduled. This initiative was held under the auspices of the Caribbean Art project (CAp), an organisation established by Erik Johnson and Meg Conlon in 2007, to promote the visual arts of Grenada. It was supported by several members of the business community including the National Lotteries Authority, Hubbard’s, Island Catering, Nice Services, LDS Security Systems, John’s Boutique, Southern Electrical, and MNIB, among others. The second part of the residency — the gathering of information to produce a short film based on Henri Christophe — requires that PrensNelo’s stay in Grenada be extended. Christophe, who was King of Haiti, was born on Sans Souci estate in Grenada. PrensNelo’s project to expose Grenada’s independence connection to Haiti, during the commemoration of Grenada’s 40th year of independence in February, is timely and important for both cultures.